I was a 15-year-old freshman at Columbine High School in Littleton, Colorado on April 20, 1999. That day might seem insignificant to many, but to me it is the day my innocence was shattered and my life changed forever. At 11:21 AM, two students came into our school and began shooting. They terrorized students and teachers, wounded over 20 people and eventually killed 12 students and one teacher before taking their own lives. It had started out like a normal day. I remember that morning being overcast and that I was really looking forward to the Lunchable I was going to eat that day. Like usual, I laughed with my friends during 4th hour science class and then headed to my 5th hour PE class. After my PE teacher took roll call, half of my class walked out of the classroom to go outside. Just as we were walking out the classroom door into the hallway, I heard two gunshots. I looked up the short hallway and saw gun smoke. I clearly remember two students’ faces as they ran toward us, yelling for us to run. Behind them was my principal, who was also running. We turned and ran through the gym doors and across the large gymnasium. My principal unlocked the door to an equipment closet where we all huddled around basketballs and volleyball nets with the door safely locked and closed behind us. We had no idea what was happening. Our world was completely rocked. I had never run for my life before and in that moment, I didn’t fully understand that that was exactly what I had done. After 15 minutes of crouching on the ground with the fire alarm blaring in our ears, we felt it was safe to unlock the door and run out of the school. As we left the closet, we were told to run as fast as we could and that is just what we did. I remember saying a silent prayer in my head as I ran and finally found safety at Clement Park. From there, we continued to walk to the local public library, which became a meeting place for students and parents. I sat in a small room in the library and watched the news reports on TV. It seemed so surreal that what I was watching was my school and my community. I waited at the library for over three hours trying to contact my parents who were out looking for my sister and me. Three long hours before they knew that I was okay. It was complete chaos. I remember when my mom and I finally found each other; I fell into my mom’s arms and finally felt safe. The following days and weeks were a blur. I felt like I was in a cloud or a dream. Falling asleep was what I dreaded the most because it meant I was left alone in the quietness of my own thoughts and flashbacks. But, through all the chaos, heartbreak and confusion there is one thing that sticks out to me: The kindness and service that was given to our family. - Our caller ID was full from the phone calls we had received from caring family and friends. Because this was before texting, Facebook and other social media, our phone was always ringing. - Our church held a meeting where we could gather together and comfort each other. They also had counselors on hand if we wanted to talk. - A memorial soon appeared at Clement Park where flowers, teddy bears, signs, well wishes, thoughtful cards, gifts and trinkets were left. - Many people were praying for us and I felt it. I felt like our nation came together. We weren’t divided by anger and political stances. The important thing was that our community was wrapped in love and prayers and those of us who were directly affected knew that we had an entire world behind us. - Our student body was sent Beanie Boos, candy, pins, shirts and tapes with inspirational music on it. - A few weeks after the shooting, we went back to a neighboring high school and there was a room dedicated just for us. There were letters, cards, stuffed animals and blankets sent to our school from all over the world. We were allowed to take some of the letters if we wanted. I grabbed a handful of them every day and I still have them. There were letters and cards sent from older people, young families, church youth groups, little kids, and high schoolers like me. They didn’t know us personally, but they sent their thoughts and prayers anyway. Even though I felt that I was in a fog for most of that time, I know that feeling love from others helped me through each day. I wrote back to a few of the people whose cards I grabbed. I began writing to a family in California and we wrote letters back and forth for years. We exchanged gifts at Christmas, and I even sent them a graduation announcement in 2002, and then a wedding announcement in 2007. For years we stayed in touch through letters. We now communicate through Facebook and they are such a big support to me still. We have never met in person, but I know they truly love and care about me and I feel the same about them. Even though Columbine was the scariest and hardest day of my life, and I continue to struggle because of it, I also recognize the good that came out of it and the tender mercies that occurred. When something bad happens, no one really knows what to do to help. But please, never underestimate the power of thoughts and prayers. I was carried by the kindness of friends, family and strangers. I may not have recognized how much those small acts of kindness meant to me back then, but they sustained my family and me. As each year passes, they mean more to me than ever. Those small acts taught me about service and kindness and has given me the ability to reach out to others during their times of need. 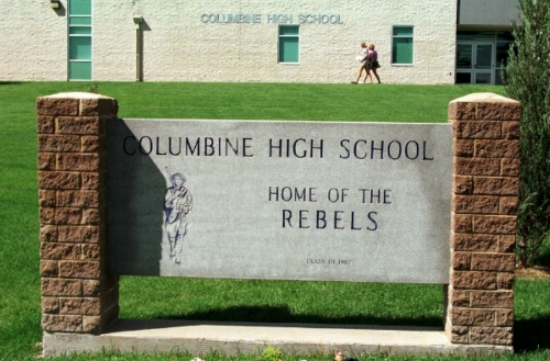 Not everyone will experience a school shooting, but we all have our own “Columbine” in our lives. It might be something that changes us or something particularly difficult. I believe that showing kindness, serving others and doing something to show we care can make a difference to anyone going through a trial. The recent shooting at Stoneman Douglas High School in Parkland, Florida has left us with broken hearts, but has also given us the opportunity to reach out and help. It could be in the form of prayers, actions, cards, letters and gifts. *Writing a letter may seem small, but it could make all the difference to someone who needs it most. In addition to the high school students, also consider also writing letters to the parents or siblings of the students, as they are also greatly affected. They need love and support and are hurting in different ways than those who were at the school that day. And remember that once the dust settles and time goes on, those involved are still suffering and struggling. You can continue to reach out to those in need, no matter what they have been through, and just show you care.